How would you go about making Glitch music? Would you chop up a sample in Recycle and simply pitch samples up and down to form a melody? Or would you use a glitch plug-in such as Live Cut, although I find this approach a real hit and miss. How would you apply a glitch to a beat? I just want to start learning the tricks behind this genre of music. Sorry for not answering this directly, but I have heard people talk about glitch, and I would like to know what it is... can you mention some artist that is fairly well-known that produces stuff in this style? There's more adventurous way to obtain glitches. Try burning some soundscapes and or beats on a cd-r, tape the cd-r to the bottom of your shoe, walk around for a while. Take the cd of your shoe and clean it good with water and soap, dry it with a towel. 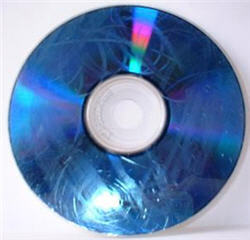 Make sure it's scratched but not broken, also make sure the scratches are not too deep, if you can look straight through a cd-r, a laser can too! Making sure that only the surface is scratched and it is clean, you're good to go! Now put it in a stereo which can record to cassettetape, i use a very cheap sony ghettoblaster. The cheaper cd player tend to play a scratched cd easier then the better ones. Record the output of the skipping and glitching cd to cassettetape and then record the cassette back to computer. You could now for example blend the recordings with the original and use filters and cut and paste techniques to "glitch" your songs! Lots of fun and it can give you a really noisy and glitchy layer to use in your work. The cassette compression and bandwith prevent the cd glitches to sound harsh, annoying or painful. Have fun and think before you do! Aha, so that's what it should sound like! Oval is probably the best place to start, musically. You may also want to read some of Kim Cascone's articles like "The aesthetics of failure". Personally I don't think any amount of dedicated plugins or bufferfuckery will get you "glitch", to me it's only glitch if something is actually going wrong and things are used in way they weren't intended to. One of the most interesting approaches to computer-based glitch I read about comes from the SuperColider world where somebody created a method of generating glitches by intentionally overloading the CPU, creating glitches in the other processes. I like to use Reaktor to produce glitchy things. Reaktor has so many wild step sequencers and samplers. You can produce a basic wav file and then use a beat slicer to cut it up and rearrange. LiveSlice is perfect for that job. Where did you learn to use Reaktor?? I just use the instruments (they call them ensembles) that come with it or that are in their vast online library. For ex: Random Step Shifter can make some incredible beats. I feed it my own wav files and adjust accordingly. I might sync that together with Newscool, another Reaktor beat generator, via Chainer or a sequencer such as Ableton. Then maybe I'll stick the resulting wav file into Liveslice and do some rearranging. I'd rather make music then spend time creating and building my own synths. Now I do prefer to make my own patches (Reaktor calls them Snapshots) from Reaktor synths. My more 'glitchy' tracks tend to involve things that started out unintentional - and then I zeroed in and manipulated what was going wrong or expanded on it. One of the cool methods I've found is to run every program that you can on your computer until it is almost to the point of freezing up. Then I run iTunes with the option to crossfade songs on, at about 4 seconds. Then run an audio capturing program. Freecorder is a good piece of freeware for this. Start recording right at the end of one piece of music/sound before the crossfade kicks in. If your processor is jammed up enough, when the crossfade kicks in to play both sounds, you'll get some cool stuttering. Save the audio the audio capture records and run it through a sampler afterwards. I seem to get cooler sounds from this then the standard samlping tiny sound clips. it's a free download now. As far as I can tell glitch can mean anything from granular synthesis (microsound) to exaggerating digital artifacts like CD's skipping, old modems, aliasing artifacts etc. Some people write generative patches in programs like Max/Msp or Supercollider that make glitch type music all by themselves. From what I've seen when people play glitch out, a lot of glitch musicians tend to favour a tracker approach to music like ModPlug, Renoise or Buzz. I just try to make some really digital synth sounds that sound almost like glitch beats. Thats where I start my "melody". For the loops, I usually use a drum machine, but for my samples, I'll find random things and f-them up with splits, cuts and effects. That CD idea posted above sounds awesome. I am totally trying that tomorrow. I HEAR you and YOUR BAND are SELLING your GUITARS and BUYING TURNTABLES. I HEAR you and YOUR BAND are SELLING your TURNTABLES and BUYING GUITARS. They Put Angels In the Electric Chair. I made some awesome glitches today by taking an old cassette and holding down a bunch of button combinations so the tape would play/fastfoward or fastfoward rewind so it was uber deep or really squeally. I got some great sounds.